I am very happy to see you all today. After so many days I have got this time to meet with you. I was very busy at the Ratha-yatra in Puri, after that I came back and have also been very busy. Actually, I also very busy today, I have an appointment with some minister that I have to attend, but it is not a question—busy or not, for the service to my Guru I can give you as much time as you want. Yesterday I celebrated the Guru Purnima. I told the devotees that it was not necessary to many anything for me—as an example for everyone, I must serve my Guru on the Guru Purnima. So, yesterday I cooked myself, some devotee came here and gave them prasadam. I was very happy. 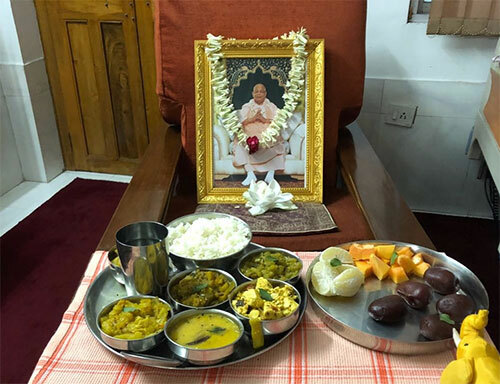 Gurudev, Srila Sridhar Dev-Goswami Maharaj always wanted to give some prasadam to the devotees, and I saw in Chaitanya-charitamrita, Prapanna-jivanamritam, and even Jagadananda Pandit's Prema-vivarta that if you have something, you must give it to others—if you have no wealth, you can give others some prasadam, and if you have no prasadam, nothing, you can give others sweet words. That is the main thing. You can make others happy with sweet words. So, I cooked myself yesterday, and I was very happy. This is how I celebrated this day. If you give a garland to Gurudev, if you pay obeisance to Gurudev, it is a formality, but the main thing is that you must serve your Guru from your heart. The problem is that everybody wants to do service, but we do not know what is service. Service means you must please your Guru, that is the main thing. Gurudev tells you, "Give some mustard oil on my head," but you are rubbing mustard oil on his feet. This is not seva. Seva is what is dear to your Guru, what Gurudev will be pleased with. This is how you must serve. You must preach Krishna consciousness. You must go all over the world, serve Krishna consciousness, preach about your Guru—do not preach about yourself. Gurudev told four types of people come to the temple—arto, jijnasur, artharthi, jnani (the afflicted, the seeker of knowledge, the seeker of happiness, and the self-realized; Bg, 7.16). I can give a political example also. Some people join politics for their own interest—to earn some money, for example; some people join a political party for their pratistha (establishment); but some people want to serve people. In a temple it is also like this—some people join for their own interest, they do not think about their Gurudev's interest. Srila Sridhar Dev-Goswami Maharaj says that you may be crying, you may be dropping so many jars of tears from your eyes, but it is not for Krishna, it is not for Gurudev—what you are doing is emotion, it is for yourself. When Gurudev chastises you, he is getting pain in his heart because he sees his disciple is going some other way, doing some other things, sees that his disciple is not following Krishna consciousness properly, is going to fall down, lose their Krishna consciousness. It is his pain, that is why he chastises you. If you cry for your Gurudev because you think that your Gurudev is very sad, your Gurudev is getting pain, then it is good for you, but if you cry for yourself, that is emotion.